David Littleproud and his counterpart Argentina’s Minister for Agroindustry, Dr Luis Miguel Etchevehere signing the High Level Agricultural Dialogue communique. 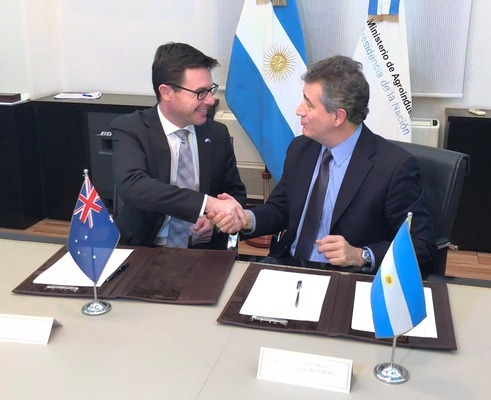 Australia and Argentina last week committed to stronger agricultural engagement and cooperation, convening the inaugural Australia-Argentina High Level Agriculture Dialogue in Buenos Aires. Local Maranoa MP and Minister for Agriculture David Littleproud said the meeting showed both countries agreed building partnerships and increasing engagement on complementary interests will benefit both nations. “Australia and Argentina are both big agricultural players in the Southern Hemisphere and historically we have been competitors,” Mr Littleproud said. “The signing of the Joint Statement is a huge step towards collaboration. We have similar challenges, including farming in varied climates, effectively managing water resources and improving farm productivity to ensure our industries remain sustainable. “I look forward to working together in agricultural technology, research and development, biosecurity and water resource management. “Australian agriculture has grown under the Coalition Government despite the challenges of a variable climate. To maintain growth we will depend on innovation and new technology and we can learn a lot from Argentina as a leader in R&D. “Agriculture is so important to our two nations and we are both keen to build trade. Minister Littleproud also represented Australia at the G20 Agriculture Ministers’ Meeting in Buenos Aires, to highlight Australia’s contribution to global food supply and the importance of global value chains for boosting rural prosperity. “Almost two thirds of our agricultural, fisheries and forestry exports go to G20 members, worth a combined $37.6 billion, so maintaining these trade relationships is essential,” Mr Littleproud said.